You may know him as the “Church Lady” or probably more so as “Garth” from Wayne’s World, Dana Carvey is the hilarious comic that was beloved by the Saturday Night Live audience from 1986 to 1992. Although he has been under the radar for a few years, he was recently at the Improv in Ontario, California, putting on a show for a handful of lucky people — one of which was me! On Monday I spent my night laughing at the jokes spit out by the side-splitting comedian. His show was full of his famous impressions, as well as an abundance of new material which he was testing out for an upcoming HBO special. It was surreal watching this man on stage, an actor who I began following as an elementary school child. Although he was mocking people, none of which were in the audience, like most comedians do, you can tell that he is a genuinely good guy. It was also nice to hear family jokes, as opposed to raunchy ones that can sometimes get old (and be uncomfortable to hear when with your parents and grandparents as I was that night). My favorite part of the show was his take on a bad day, which he dubbed the “fuckits.” You know, your day starts off well, you’re sticking to your diet, you plan on going to the gym later…then you eat a cookie, or several. Well, it’s too late to get back on course so you develop a case of the fuckits. So that is how I have spent my week, with a whatever type of outlook. Life is good as long as I have family, friends, and laughter. Everything else is circumstantial. Who knew that Dana Carvey could put a person in such as good mood?! I highly recommend seeing him if you ever get the opportunity to do so. 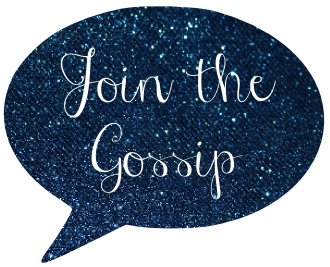 Win a J'aime Collection Dress by Jaime Pressly! I recently had the opportunity to interview Jaime Pressly (the famous actress from "My name is Earl") for a feature on Beauty Chat. In addition to talking about how she multi-tasks all of her endeavours, she also dishes on the debut of her spring/summer 2008 J'aime Collection clothing line. About a month back I was trying to decide between purchasing a Juicy "Velour Daydreamer" tote or "The Dutches" by Fergie. Well, I finally made me choice -- neither. I decided to go with a pricier spend and sping for a L.A.M.B. purse...a L.A.M.B. Signature Rasta Commodore Hobo to be exact. It cost much more than the other purses, but I had to have it. It is adorable! Plus there are "L's" all over the handbag...it was made for me (Leeann)! I appreciate everyone's opinions on the Juicy and Fergie purses, sorry I didn't choose either. But don't you think that this one is much cuter? 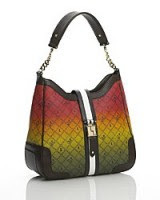 Mrs. Gwen Stefani really knows how to design an fabulous hobo! W-O-W! Heidi Montag’s “Higher” music video debuted this Monday and it is awful. And I don’t mean in the sense that it’s not my cup of tea, I mean it is really horrid. I am usually pretty forgiving of anyone who puts themselves out there to sing (I wouldn’t be caught dead belting out lyrics in front of anyone! ), but seriously…she has to have some idea of what her voice sounds like. Heidi (who you know from "The Hills") sounds like a digitally remastered American Idol rejectee. And even worse, the video was shot by Spencer! For The Hills cast mate Audrina Partridge’s reaction, visit Hollyscoop.com. The film is about a mean, geedy man (Day-Lewis) who is an oil prospector just after the turn-of-the-century. To me, it was almost like a biographical film, following part of this character's life. There wasn't a real clear meaning of the movie, and by that I mean, I didn't eaxctly know why things were happening. The scenes left me feeling a bit uncomfortable because it was as if I was peeking into the life of a man who I couldn't figure out. Maybe that was the idea though, to make you feel awkward about the behavior of the character. And the ending, let's just say that I was left a little bit bewildered. On the other hand, I must celebrate the acting of Day-Lewis. He was brilliant. This man is an amazing actor who always seems to scare the heck out of me (think Bill "The Butcher" in Gangs of New York). He was recently awarded the title of best actor at the Screen Actors Guild Awards and also best actor in a drama at the Golden Globes for this role. Deservedly so. Had it not been for the performance of Day-Lewis I think I would have hated the movie. But, because this actor was so talented, I was left wanting to understand what was occouring and why he behaved the way he did. Maybe I was just trying to over-define a film that was meant to be taken at face-value. Did anybody else see this film? And if so, were your thoughts similar to mine, or did you understand the movie? Because if you got it, then please explain it to me! 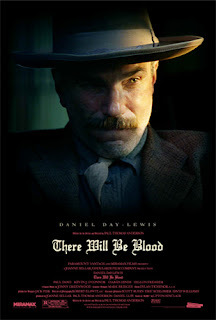 Watch movie trailer for "There Will Be Blood"